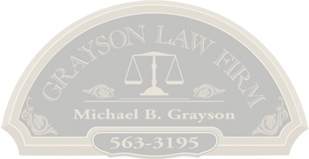 Grayson Law Firm gets you good results! Here are results from just a few legal cases we have handled in recent years. Please note that every case is based on its own unique facts. Client who was injured in a car accident on Interstate 90 near Missoula calls asking if $18,000 was a fair settlement for her case. We took the case, researched all facets of the client’s damages, worked up a full settlement brochure, and obtained a settlement of $60,000. Even after paying attorney fees the client ended up far better off than had she accepted the insurance company's offer. Montana woman fell in a poorly lit bar while going down several uneven steps, badly injuring her leg. We obtained photos of the defective area, strong medical records from her doctor, and then prepared a full settlement demand on her premises liability case. We obtained a total settlement for her of $130,000. Montana woman was badly hurt in a head-on collision near Bozeman. She had been offered 'policy limits' from the other driver's insurance company. We took her case, and also obtained an additional $75,000 for her from her own carrier's underinsured policy. Child killed in a one vehicle auto accident in eastern Montana. We obtained a settlement of $795,000 for her family. Man injured in a crash with a truck in Missoula, Montana. Insurance company denied liability, and refused to pay anything for his damages. We filed suit, and reached an out of court settlement of $30,000 with the responsible party. A Butte lady was injured in a car accident by another driver. Her injuries were relatively minor, and we helped her get a $19,000 settlement. A Montana man was killed in an industrial accident due to the fault of a third party. His children obtained work comp benefits till they finished school or turn 22, and we negotiated a total settlement of over $2 million dollars from the responsible parties. A Montana man was seriously injured through another party's negligence. We pursued this case for over three years, finally obtaining a settlement well in excess of $1 Million dollars. These results were obtained by listening carefully to our clients, fully developing the facts of each case, conducting thorough legal research, and then preparing detailed settlement brochures that fully covered the relevant facts of each case. These results are not fully representative of all of our cases. We have cases where we got greater or lesser amounts, and each case depends on the individual merits of that case. Past performance is no guarantee of future outcomes.